Cardinal Timothy Dolan waves to supporters after celebrating Mass at this titular church in Rome. 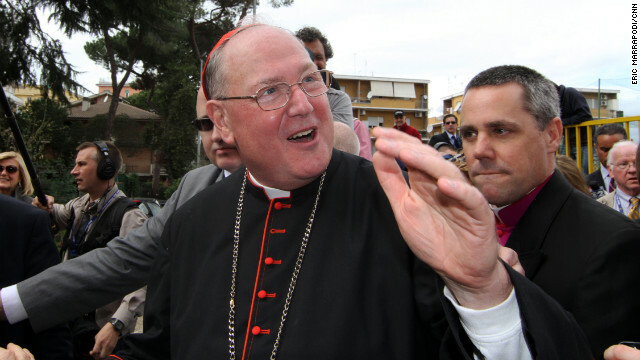 Rome (CNN) - Crowds lined the walls and spilled out the front door of the Church of Our Lady of Guadalupe on Monte Mario on Sunday to catch a glimpse of the gregarious American Cardinal Timothy Dolan, archbishop of New York, who smiled broadly as he came into the church, stopping to wave to photographers and kiss a baby whose parents were holding him up. Dolan has made the short lists of some Vatican watchers as a likely choice to be elected as the next pope by the College of Cardinals, a designation called "papabili" in Italian. A local officiant began the service by saying it was great to have Dolan at the church close to Easter. "All these people are showing the power of the church," he said. Dolan thanked the officiant in Italian. "Thank you for the kind words. This is a big task. Truly a blessing to be with you. Now let's get to why we're here - to pray." He led the congregants of his titular church in a prayer of contrition. A titular church is the house of worship in Rome assigned to a cardinal when he gets his red hat. It's by virtue of technically being a priest of Rome that a cardinal gets to vote for the Bishop of Rome - the pope. The Mass proceeded in Italian. In his homily, Dolan said he was "full of joy to be here at my titular church" and that he always feels "at home here." "After St. Patrick's Church - here's a secret - this is my favorite," Dolan said, drawing applause from worshippers. "Don't tell the people of New York, OK?" He spoke briefly about the reason the world's cardinals have descended on Rome, the conclave, which he called a "system of prayer - and it's also a joy for the cardinals to pick a pope." "Thank you for being here," he said. "I'm not going to say too much. Just thanks for being here with me. " After the service, reporters were hustled into an alley, then led to a courtyard in the rectory next to the church. Dolan fielded a bevy of questions from reporters on the cardinals' thinking heading into the conclave and speculation he may be the one to emerge as the next supreme pontiff for the Catholic Church. He laughed off many of the questions and said the cardinals were ready for their time of prayer and discernment. Dolan said not only was he ready for the conclave to begin but he also added, "I'm ready to go home - I’ve run out of socks." When asked what type of socks he needed, he said he needed green socks for St. Patrick's Day, because he already had plenty of red in his cardinal wardrobe. Hi I am so thrilled I found your blog, I really found you by accident, while I was searching on Google for something else, Anyhow I am here now and would just like to say thanks a lot for a marvelous post and a all round thrilling blog (I also love the theme/design), I don’t have time to look over it all at the minute but I have book-marked it and also added in your RSS feeds, so when I have time I will be back to read much more, Please do keep up the fantastic work. Mark Chapter 13 pretty much says it all.... If you care to read it go ahead and do so with a mind at peace... read the whole thing and try not to pick and choose what defines your beliefs. Christians must pass through the tribulation... and it is all around us.... persecuted by Pagans during the early church and at the end,,,, it was all foretold. So every other religion outside of yours are known as Pagans? Good to know. I was under the impression that they were no less valid than the one you believe in. The Jews, Hindu, Muslims, etc will be thrilled to know. I foretell that the Men of the cross will face great hardship at the hands of the two tailed fire breathing monkey who will spring from the great waters. Meanwhile a nation of gold will spread bright poppies over clouds of doom for Islam and his brothers. But oh great joy the Hindus and atheists before the feast of ox and light. Hail to the 893,421 brave souls of the great mountain pantheon. They will bring truth in the silver chariot and for 90 years there will be peace and tears. Was it foretold that your religion would become increasingly unreal and irrelevant even to its fewer and fewer followers? Its so nice to see that there are 3 honest people... ones that post with no regard to the request. Ones that post simply to satisfy their own deep seated need to be above all things and look down their nose at people. You reject the possibility that people are different and you scoff at other peoples belief.. you make comments designed to denegrae people and their beliefs and then you call yourselves enlightened.. At least you honestly post what you truly are. Bottom line: There are many good ways of living but be aware of the hallucinations, embellishments, lies, and myths surrounding the founders and foundations of said rules of life and religion. Then, apply the Five F rule: "First Find the Flaws, then Fix the Foundations". And finally there will be religious peace and religious awareness in the world!!!!! Christians, what animals were on he arek? Ants? Worms? amoeba? Bed Buds? Coral? extremophiles? Aztecs were on the Ark, obviously. The Ark dropped them off in Central America. It was god's plan to later have the Spanish come invade them to convert them to catholicism and kill them by the thousands. Ten signs you are a Catholic. 1. You honestly believe that an all powerful, immortal being created the entire Universe and its billions of galaxies (each with billions of stars) about 13,720,000,000 years ago, then sat back and did nothing for virtually all this time, until h.omo Sapiens evolved on one planet, then sent his “son” to visit some Jews in the late Iron Age Middle East and tell them parables about wheat, goats and sheep. 2. You believe that priests have special, magic powers that nobody else does, that allow them to turn grocery store bread and wine into the actual flesh and blood of a crucified apocalyptic Jew from 2,000 years ago. 3. You believe that, when you think silent thoughts like “please God, help me pass my exam tomorrow,” the being that created the entire cosmos reads your mind and will intervene to alter what would otherwise be the course of human history in small ways to satisfy your concerns – or “answers your prayers” as you call it. 4. You are about 60% likely to believe that the entire Universe was created less than 10,000 years ago with one man, one woman and a talking snake. 5. You believe that your “all loving” god will cause those who are smart enough to be honestly and rationally skeptical of his existence to suffer an eternity of torture an infinite times worse than anything Hitler came up with. You don’t have to kill, you don’t have to steal, hell, you don’t even have to litter. All you need do is honestly, rationally and reasonably reject a belief in the Catholic god and he will inflict a barbaric eternal torture on you an infinite times worse than the death penalty……and he loves you. 6. You base your belief almost entirely on the life and divinity of Jesus Christ, blissfully ignorant of who wrote the 4 gospels upon which this belief is 100% based, how the gospels were altered over the Centuries and when and in what language the authors wrote. 7. You probably don’t even know anything about how the Bible was compiled, who write it, who decided what books to include and what to exclude and the criteria they used, yet you base your entire view of life, death and the Universe on it. 8. You believe you will live for ever after death, with zero evidence to support such a preposterous claim. 10. At its core, Catholicism requires a belief that a god impregnated a virgin with himself, to give birth to himself, so he could sacrifice himself to himself, to forgive the original sin of a couple that anybody with a fifth grade education knows did not exist. I love reading your post. I agree with Answer. Your posts are, as always, straight up and to the point. With all due respect – your post is true about Christians. To be specific to Catholics you would need something in there about the Pope being their spiritual voice of their god here on earth. There is an old adage that goes something like.."It is better to remain silent than open your mouth and prove your ignorance"
•	AND THAT LIFE EMERGED FROM NON-LIFE." "....THAT ALL OF THIS HAS BEEN CREATED FROM NOTHING IS ABSURD: IT PRESUPPOSES A CREATOR." "ATHEIST BELIEVE THAT A "MULTIVERSE (FOR WHICH THERE IS NO EXPERIMENTAL OR OBSERVATIONAL EVIDENCE) CONTAINING AN INCONCEIVABLY LARGE NUMBER OF UNIVERSES SPONTANEOUSLY CREATED ITSELF"
YET, CHRISTOPHER HITCHENS ET AL INSISTS.."OUR BELIEF IS NOT A BELIEF"
"NONSENSE. ATHEISM REQUIRES A BELIEF IN THE UNBELIEVABLE." "CHRISTIANS BELIEVE CHRIST COULD RAISE PEOPLE FROM THE DEAD BECAUSE HE IS GOD. THAT IS FAITH. ATHEISTS BELIEVE LIFE CAME OUT OF NON-LIFE. THAT, TOO , IS FAITH. THEY BELIEVE IN WHAT THEIR GOD, SCIENCE, CANNOT DEMONSTRATE, REPLICATE OR PROVE. THEY BELIEVE IN MIRACLES BUT CANNOT IDENTIFY, PRODUCE, OR DESCRIBE THE MIRACLE WORKER." "ATHEISM IS THE ABSURD WRAPPED IN THE LANGUAGE OF THE INANE PROMULGATED BY SOULESS ELITES MASQUERADING AS EFFEMINATE SNOBS". Back at you. Take Care. You have to love how the inane christians love to shout in capitals. Just shows you how ignorant they are.. no one reads anything when posted in all caps. And then he proved that saying with the rest of his post. "There is an old adage that goes something like.."It is better to remain silent than open your mouth and prove your ignorance"
Great. Refute something I said. Your entire post below refutes none of my points. If I am ignorant in something I said, tell me. First, most atheists don’t. Believers do – unless you can tell me where your god came from. He was “always there”, right? Well, why not just say the Universe was “always there” and stop there? Why extrapolate an unsupported intermediary? There is good reason to believe, based on the conservation of energy/mass, that the Universe was “always there” but we just don’t know. Not sure what you mean. If you mean “reason” as in a mental process, well, yes. To the extent it is a direct product of the evolution of the human (and perhaps other species’) complex neocortex, we do believe that. So what? Yes, we believe that, in general. What makes that an irrational thought? • AND THAT LIFE EMERGED FROM NON-LIFE." Nonsense. Complexity presupposes no such thing. Complexity can arise from purely natural processes. If complexity required a creator, would not your god, being a complex being, require a creator – and his creator a creator, etc. A logical absurdity. If you are skeptical of the multiverse theory, great. Many atheists are, too. I will believe in a multiverse upon the presentation of evidence to support it. Try that approach some time. There is a small difference. Our views, to the extent we hold them, are underwritten by evidence. Ad hominim attacks are a waste of time.